Teen drug cartel hitman deported from Mexico to U.S.
MEXICO CITY - A 17-year-old U.S. citizen who acknowledged being a killer for a Mexican drug cartel finished his three-year juvenile-offender term for homicide, kidnapping and drug and weapons possession and returned to the United States, a Mexican official said. The interior secretary of southern Morelos state, Jorge Messeguer, said Edgar Jimenez Lugo has been released, though he added it wasn't clear if the teen had been rehabilitated. "Being able to say whether he's been rehabilitated, that would be risky. I wouldn't really dare say that, because obviously the crimes he committed were so severe," Messeguer said. He said Jimenez went to San Antonio, Texas, where he has family and apparently will go to a residential support facility there, though he didn't know its name. It does not appear Jimenez faces any charges in the United States. The U.S. Embassy said it would not publicly discuss the case due to privacy considerations. The embassy said in a statement that it was "closely coordinating with our Mexican counterparts and appropriate authorities in the United States" regarding the release. 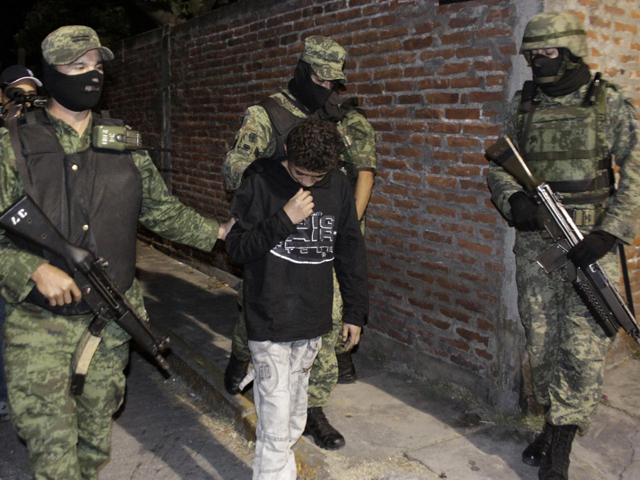 In 2011, at age 14, Jimenez, who also goes by the name "El Ponchis," confessed to killing four people whose beheaded bodies were found suspended from a bridge. He was born in San Diego, Calif., but was raised in Mexico by his grandmother. According to the Los Angeles Times the boy’s grandmother died in 2004 and consequently he dropped out of third grade. Authorities quoted Jimenez as saying he had been forcibly recruited by drug traffickers when he was 11 and confessing to working for the South Pacific drug cartel, led by reputed drug lord Hector Beltran Leyva. The paper reports Jimenez was 11 when he killed for the first time. The teen reportedly said a cartel enforcer, who threatened to kill him if he did not follow his orders, forced him to murder another man. Jimenez was trying to return to the United States when he was caught in 2010. He and a sister were arrested in Morelos, south of Mexico City, as they tried to board a plane to Tijuana, where they planned to cross the border and reunite with their mother in San Diego. When he was handed over to federal prosecutors, the boy calmly said in front of cameras that he participated in four killings while drugged and under threat. The bodies were found in the tourist city of Cuernavaca, which is in Morelos. Jimenez served his three-year sentence, the maximum for juveniles, at a juvenile detention center in Morelos. The state was formerly controlled by the Beltran Leyva gang, which broke up after alleged leader Arturo Beltran Leyva died in a shootout with Mexican marines in 2009.